Schlock-Wire: Complete Specs For Shout Factory’s 2-DVD Special Edition of STARCRASH – Schlockmania! with a Galaxy’s Worth of Special Features! One of the most eagerly awaited inter-galactic science-fiction adventures, released by Roger Corman’s New World Pictures, will finally be made available for the first time to the home entertainment shelves as StarCrash, directed by Luigi Cozzi, will debut September 14, 2010 on 2-Disc Special Edition Blu-ray and DVD from Shout! Factory, in association with New Horizons Picture Corporation. An adventure like no other, the StarCrash 2-Disc Special Edition contains anamorphic widescreen presentation of the movie with DTS HD 5.1 surround sound (Blu-ray), a reversible cover featuring vintage art for original movie posters and a payload of bonus content including all-new interviews and commentaries with cast and crew, rare behind-the-scenes footage and much more! A must-have for loyal fans of Roger Corman and Luigi Cozzi, science fiction enthusiasts and collectors, StarCrash 2-Disc Special Edition Blu-ray and DVD mark the latest installments from the popular ROGER CORMAN’S CULT CLASSICS home entertainment series from Shout! Factory. Each Special Edition Blu-ray and DVD is sold separately. Blu-ray is priced to own at $26.97; and DVD is available at $19.93. 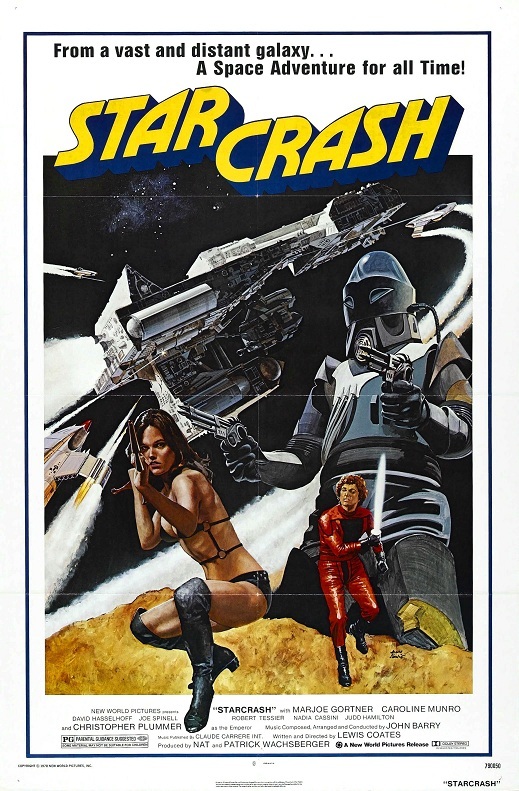 Produced in Italy in the wake of Star Wars’ phenomenal success, StarCrash (also known as The Adventures of Stella Star in overseas territories) became an international blockbuster in its own right. This 1979 film became one of New World Pictures’ biggest box-office hits. Critics might have laughed, by so did audiences, who grooved to its campy humor, wildly imaginative special effects (some of them quite good!) and non-stop adventure. Where Star Wars dared not go, StarCrash went — at warp speed! The lasting peace of the galaxy is threatened by the diabolical and relentless Count Zarth Arn (cult icon Joe Spinell, Rocky, The Godfather and The Godfather – Part II), who is determined to take the universe for himself and make each planet his plaything, each inhabitant his slave. There is no question that the Count is evil, given his propensity for cackling at every opportunity. Can anyone save the universe from this megalomaniacal madman? Indeed there is, and she’s quite a beauty. Brave, bikini-clad star warrior Stella Star (Caroline Munro, The Spy Who Loved Me, At the Earth’s Core) and her co-pilot Akton (child evangelist-turned-actor Marjoe Gortner, Food of the Gods, Mausoleum) are pressed into service to thwart the evil Zarth Arn’s plot. If they succeed, galactic peace will be achieved. If they fail, the universe will fall into decay and destruction at the hands of its sadistic new overlord. Have no fear, because Stella Star is here! The film’s zesty, star-studded cast also includes People’s Choice Award winner David Hasselhoff (Knight Rider, Baywatch) in one of his first big-screen roles, noted screen tough guy Robert Tessier (The Longest Yard, The Cannonball Run) and legendary two-time Emmy® and Tony® Award winner, and Academy Award® nominee Christopher Plummer (The Last Station, Murder by Decree, The Sound of Music) as The Emperor. StarCrash was written and directed by fan favorite Luigi Cozzi (AKA Lewis Coates), whose other cult masterworks include Alien Contamination (an “homage” to Alien) and the unforgettable Lou Ferrigno vehicle Hercules (an “homage” to Conan the Barbarian). The film also boasts a rousing score by five-time Academy Award® winner John Barry (Dances With Wolves, Out of Africa , 10 James Bond films). Alas, StarCrash would prove to be the only big-screen Stella Star adventure … but as its worldwide legion of fans will attest, it was one to remember! Commentary 1: the history of StarCrash, the making of the film and its importance in 1970s fantastic cinema. Commentary 2: StarCrash scene-by-scene: production trivia, anecdotes and critical analysis. · Behind-the-scenes image gallery, featuring storyboards, art, and rare, never-before-seen photos! · Theatrical trailer with commentary by Eli Roth from Trailersfromhell.com and an all-new exclusive trailer commentary by filmmaker/editor Joe Dante! Shout! Factory will continue to present ROGER CORMAN’S CULT CLASSICS home entertainment releases on a monthly basis. Upcoming highlights include The Slumber Party Massacre collection, The Evil, Twice Dead, The Warrior and The Sorceress, Barbarian Queen, Not of This Earth, Terror Within, Streets, Angel in Red, Lady in Red, Crazy Mama, Big Bad Mama, among others.